This PosSizer combines the features of Winning Streaks and Losing Streaks and provides additional flexibility. You can vary position size based on outcome of previous closed trade. First, you need to specify the initial size as a percentage of your equity. If the previous trade was a loser, it's possible to either decrease or increase the size of the position to be taken. Likewise, you can do the same if the previous trade was a winner. 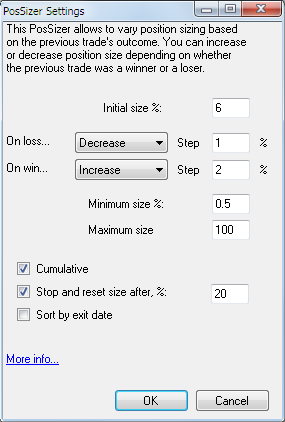 On each consecutive winning or losing trade, the position size will be changed accordingly by adding or subtracting a percentage of equity specified as the "Step". So that the size would not drop below 0, making the system stop trading, specify a minimum position size as a percent of equity. The "Cumulative" option has a noticeable effect on the PosSizer's behavior, allowing to exploit a system's tendency for winning or losing "streaks". If it's active, each consecutive winning or losing trade will increase or decrease the position size, being limited by the minimum and maximum position sizing constraints. Hence, the trade size can be allowed to increase to a significant amount of equity - for example, desirable for systems with a historical record of prolonged consecutive winning streaks. Note: the percentage specified in "Stop and reset after..." has precedence over the maximum % size option. When it's turned off, the position sizing becomes much more conservative. A string of consecutive winning or losing trades will not keep on constantly changing the size. Instead, it will be increased or decreased just once, and an "opposite" trade will reset the size back to normal. Finally, "Sort By Exit Date" changes the order of previous positions so the trades are accessed in order of exit date.